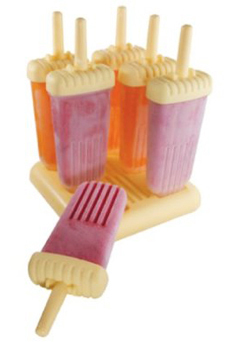 It’s time to invest in some ice pop molds. Photo courtesy Tovolo. CAPSULE REPORT: It’s easy to make a healthy frozen treat to help cool off in the dog days of August—and save money over going to the frozen yogurt store. All you need is fruit, yogurt and and sweetener. Take advantage of the summer peach and nectarine crops or use other favorite fruits such as raspberries or strawberries. Purée fruit in food processor. Add yogurt; blend until smooth. If you don’t have an ice pop mold, pour mixture into 4-ounce paper cups (you can use plastic but they’re not environmentally friendly). Partially freeze; then add ice pop sticks. To avoid that woody taste, use plastic spoons in place of sticks (we recycle the spoons from takeout food). You can make coffee-flavored ice pops or any of your favorite flavors. Find more frozen delight recipes. Use this handy conversion chart. It can also be used for apples and other fruits similar in size to peaches and nectarines.